Hey, strangers! I’m feeling especially inspired to share some new recipes and travel tips with you, after spending an amazing long weekend in New York City. The trip was a 30th birthday gift for James. Some of his best friends from college live in Brooklyn, and he loves visiting them. Somehow, this is the first time I got a chance to tag along! I’ve only been to NYC once before — more than a decade ago. My mom and some of her friends took me as an early 18th birthday present, and we spent all of our time taking in the sights and sounds of Manhattan. I was long overdue for a return trip! We got in late Friday night, thanks to a flight delay, but we were up early Saturday morning and eager to explore Brooklyn. We stayed at a friends’ apartment while they were out of town, but also spent quite a bit of time with our friends Larry and Erin. They live about a five minute walk away from where we were staying, and were the most amazing tour guides the entire weekend. My favorite way to vacation is by experiencing a city the way locals do. That’s exactly how we spent our first day in Brooklyn, and it made it easy to see why so many people move to New York. The day started with coffee and croissants at our friends’ favorite neighborhood bakery, before we spent some time browsing at a couple local shops. 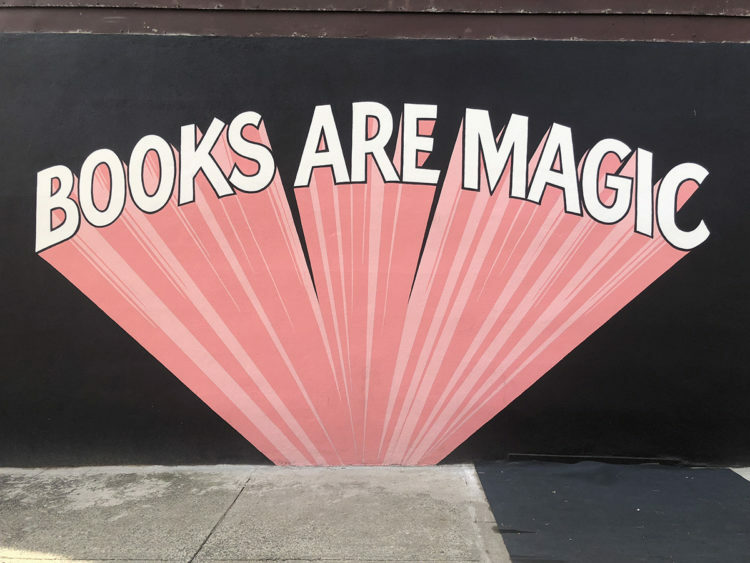 I immediately fell in love with an independent bookstore called Books Are Magic,which has a stellar cookbook selection. I actually went back a second time that day to pick up a few more Short Stack Editions, which are amazing, short cookbooks that are focused on one particular ingredient. After doing some shopping, we grabbed a couple of amazing sandwiches from Court Street Grocers on our way to Valentino Pier, which Erin says is one of her favorite spots in the city. There’s plenty of space to tie up hammocks or throw down a blanket and take in the amazing views of the Harbor and Statue of Liberty. 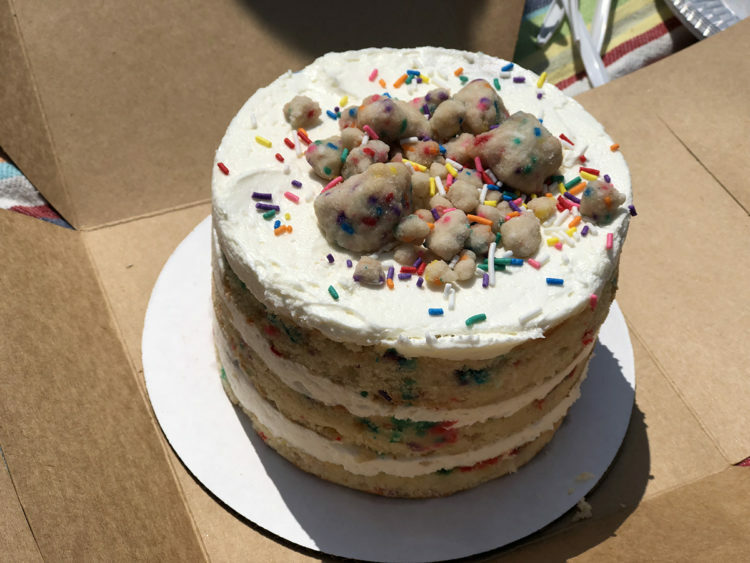 We enjoyed our sandwiches and the sunshine, then dug into a birthday cake Larry and Erin got James from Milk Bar. I’ve heard so many people rave about these cakes, so I was pretty excited to finally try one. It’s like a grown-up funfetti cake, and it definitely lived up to the hype. I especially loved the rainbow cake balls on top. We took a brief break from stuffing our faces with carbs before Larry and James headed out on a mission: get a table for dinner at Lucali. 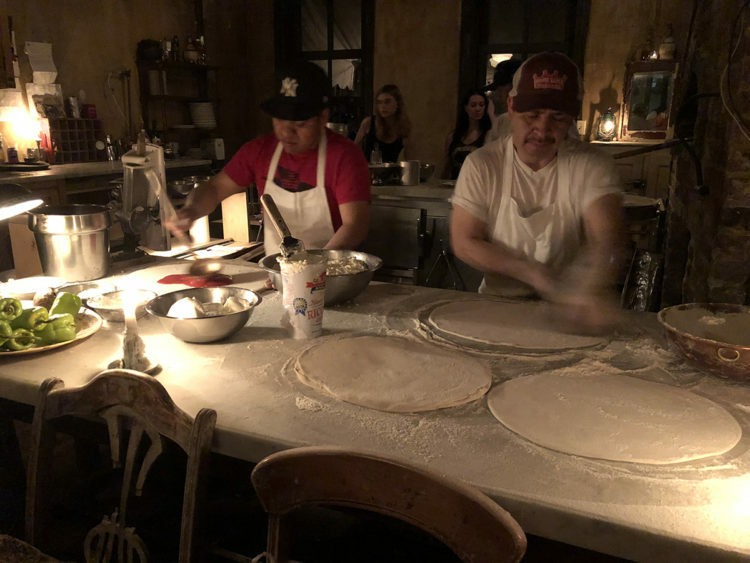 If you haven’t heard of this super popular pizza joint in Brooklyn, go watch the first episode Ugly Delicious to see what all of the hype is about. Since appearing on that and several other shows, the restaurant is even more popular. James had been before and kept saying how excited he was for me to experience it for myself. That meant he and Larry had to go stand in line with dozens of other people just to put their names in for a table. Bless them for doing the hard part, while Erin and I hunted down wine. We killed a few hours walking around and hanging out at the apartment before our 9 p.m. seating. Boy, was it worth the wait. What’s so great about Lucali is it’s a no-frills pizza place. You order a pizza or calzone, with about six toppings to choose from. We ordered two pizzas and a calzone, which I never thought we would finish. But, we ate every last bite. The simplicity of the pizza let the quality of the sauce, cheese and huge amounts of fresh basil shine through. The crust is my favorite kind: super thin and crispy, with the perfect amount of humped dough around the perimeter. And, the atmosphere was pretty amazing. The restaurant is very small, with the staff making pizzas out in the open. It’s cozy and intimate — or as intimate as a super-popular restaurant can be. Any time a restaurant is talked up so much, I worry I’ll walk away disappointed because all of the hype. Lucali was just as amazing as everyone said. We went to bed with tired feet and happy stomaches. Sunday started the way Saturday ended — with a feast of carbs. We had brunch at Frankies 457, which several friends had also raved about in the past. We all ordered our own entrees and split an order of the french toast for dessert (because calories don’t count on vacation, right? ), and everything was phenomenal. James and I then headed out on our own to play tourist for a few hours. Our first stop was The Other Half, a brewery in Brooklyn I’ve been dying to try. 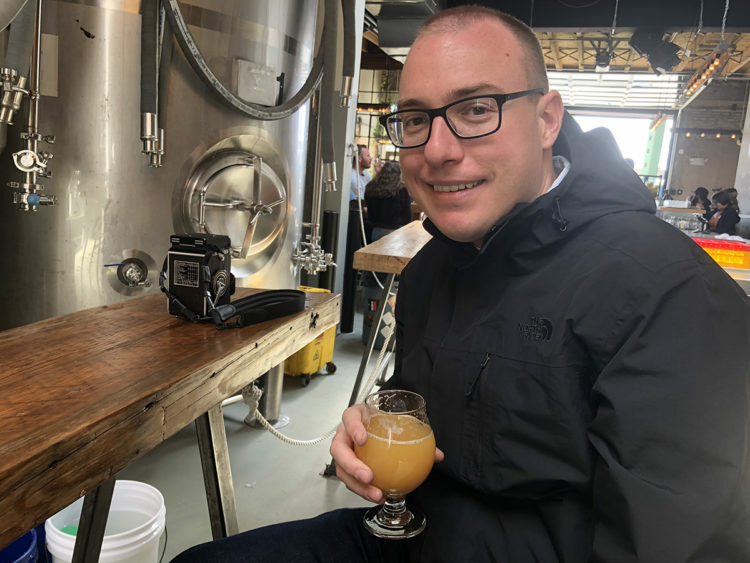 It’s known for its impressive list of super-hazy IPAs, and I couldn’t believe how many different versions they had on tap. I got a 4 oz. pour of Einstein’s Daydream and Double Dry Hopped Cheddar, which were both Imperial IPAs. They were so damn good, and we probably would have hung out at the brewery all afternoon if we weren’t so stuffed from consuming nonstop carbs. We grabbed a Lyft to Manhattan to walk off some of what we consumed on The High Line. The city took over the old rail line and converted it into an amazing public space with walking paths, beautiful plants and artwork. 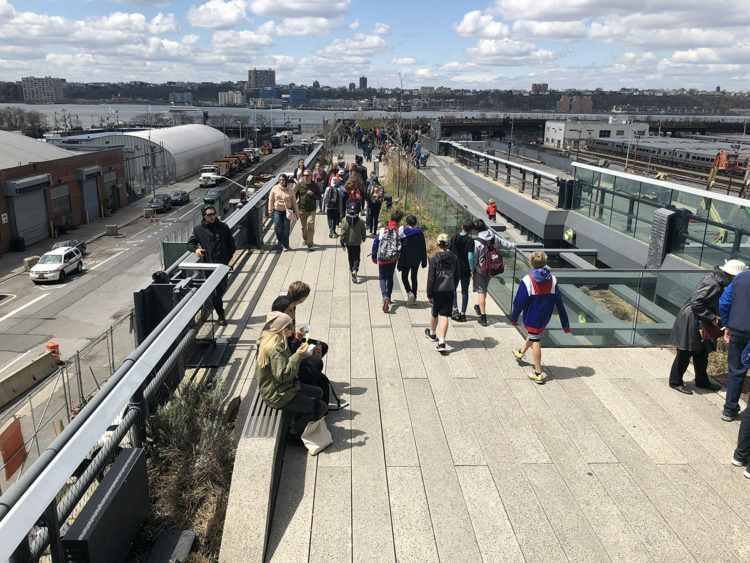 Walking along the High Line is a great way to see the city from different perspectives. And, we had the perfect, sunny day to take advantage of the views. We walked as far south on the High Line as we could before hopping on the subway and heading over to see the 9/11 Memorial. The two waterfalls are placed where the towers once stood, and are inscribed with the names of every person who died. Seeing the memorials in person was emotional, but something I’m so glad we did. I was especially touched by the Survivor Tree, which somehow withstood the carnage of the attacks. While it was severely damaged, the city was able to save and nurture the tree for several years before returning it to the site of the memorial. What a fitting symbol of resilience. We capped our day of sightseeing off with a late afternoon treat at Supermoon Bakehouse, which looks like it was made for photo opps. 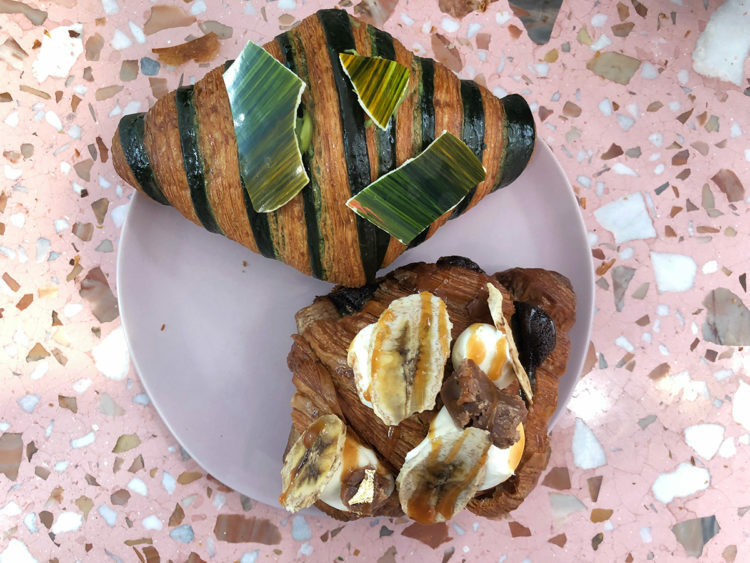 I came across the bakery while perusing Instagram one day, and James kindly trekked to another area of the city so we could check it out. He got a matcha lemon croissant, while I opted for the banana sundae version. They were both insanely good, with such unique flavors. But, I actually think I preferred James’ —the more simple filling let the pastry itself shine. We were stuffed, and happy to spend the rest of the night in having dinner and watching a movie (Brooklyn, appropriately) at Larry and Erin’s. It was the perfect Sunday night. We didn’t let our last full day in NYC go to waste. 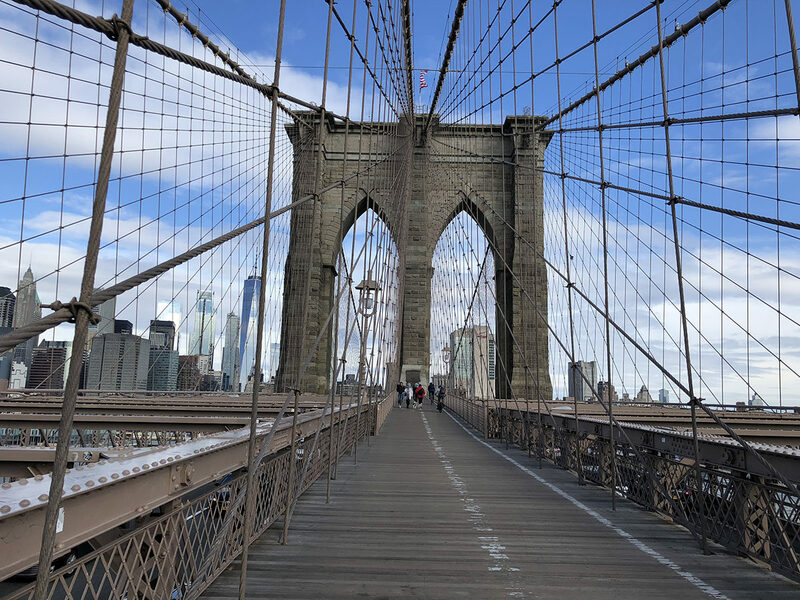 We woke up early to walk over the Brooklyn Bridge with Erin in the morning. 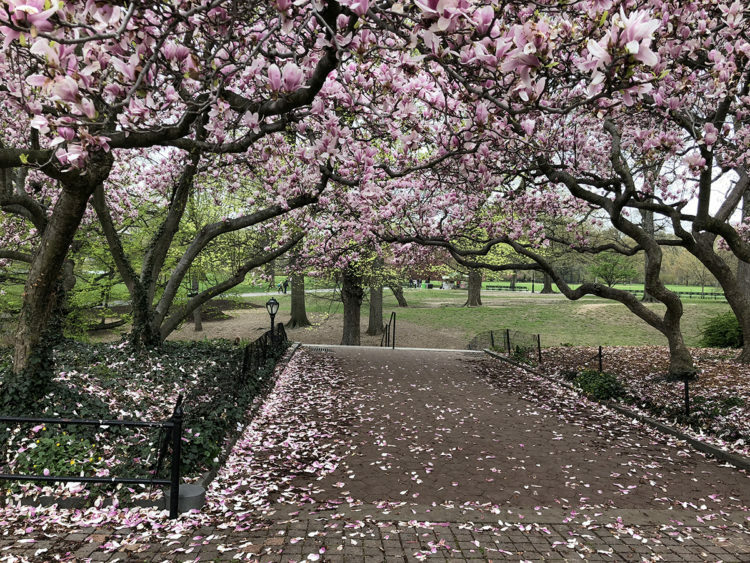 She makes the walk everyday to get to work, and it may be the most amazing commute in the country. The bridge itself is stunning, and the views of the city are breathtaking. We lucked out with mostly sunny weather during our trip, and the most beautiful blue skies. Once getting across the bridge, James and I headed off to grab breakfast before taking the subway to Central Park. One of my favorite things to do when visiting cities is to take advantage of the unique outdoor spaces. It’s pretty amazing to be walking through such a lush, beautiful park, while also seeing the NYC skyline in the background. It started to drizzle a bit, so we ducked into The Met for a few hours. Neither of us had been, and we both found ourselves wanting to look at every single exhibit. If only we had more time! We decided to focus on what we wanted to see most: The American Wing, Greek and Roman sculptures, Ancient Egypt and photography. I’ve always loved art, and it had been a while since we’d gotten a chance to check out a new museum. I love discovering new artists through the exhibits, and seeing paintings I remember from books in person. Washington Crossing The Delaware surprised me the most, because I had no idea the enormous scale of the painting. Both the painting, and the intricate frame that held it, were breathtaking. 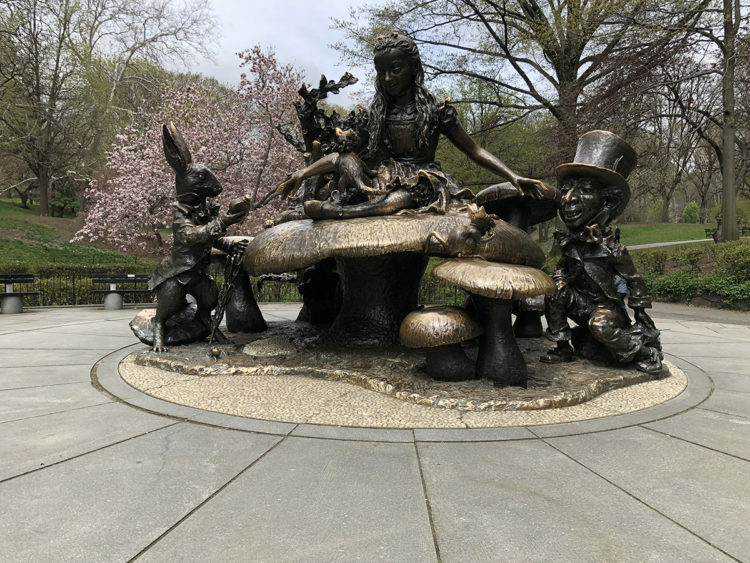 Once we finished our speedy tour of The Met, we headed back to Central Park to walk past the Alice In Wonderland statue, boating pond, and Strawberry Fields. We had a specific destination in mind: another bakery. Because I love baking, I always like checking out different bakeries while vacationing. We walked more than 30,000 steps several of the days we were in the city, so I’d like to think we earned it? We grabbed a chocolate chip walnut and chocolate peanut butter chip cookie from Levain to split, and all other cookies are now ruined for us. I’m not a huge cookie lover, so I was skeptical about Levain’s baked goods being as good as everyone said. I cannot begin to describe how wonderful those cookies were. They were thick, rich and perfectly gooey. Now I understand why there’s oftentimes a line out the door. The sugar helped reinvigorate us for the last big event of the trip: seeing the Colbert Show! This is something James has always wanted to do, so we requested tickets as soon as we booked our flight. Erin and I snagged a couple priority seats, while James and Larry got tickets in the balcony. The taping is a several hour commitment: you check in, wait in line to get in, then a comedian and the band warm the crowd up before the show starts. 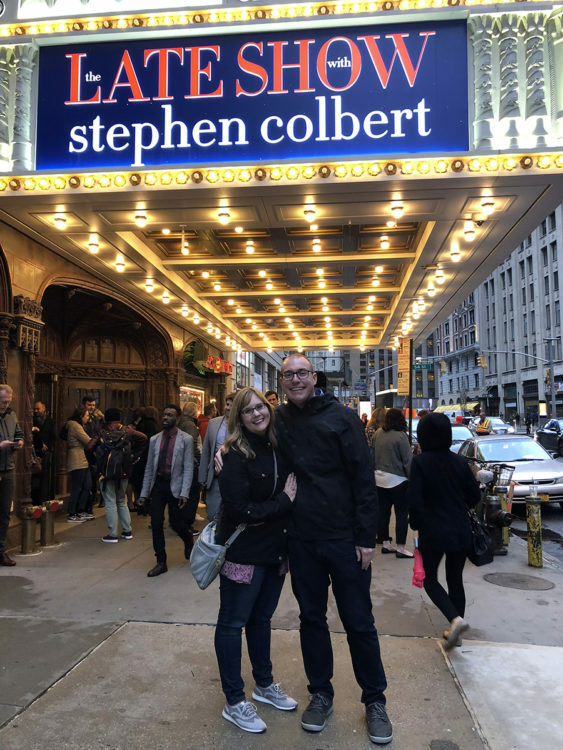 It was so cool to see the behind-the-scenes work that goes into getting the show on the air every night, and Colbert never disappoints with his jokes. I was cracking up the entire time. We ended the night with ramen and one last indulgent dessert — the perfect way to cap off our trip. The weekend was the perfect balance of experiencing the city like a local, and hitting up some of the tourist spots we’ve always wanted to see. Like so many others, I fell in love with New York and found myself wondering what it would be like to live there. I can’t wait to make another trip to the city! But, until then, I’m in need of a serious carb detox.